Ranger400, Ranger700 and Ranger800: Self-Powered Portable BDA Systems Connect the First Responders Anywhere Anytime. Ranger400, Ranger700 and Ranger800 are self-powered BDAs which are transportable and re-deployable on various emergency sites to secure seamless radio connections in buildings, tunnels, subways, basements, underground parking lots and other dead zones for first responders. 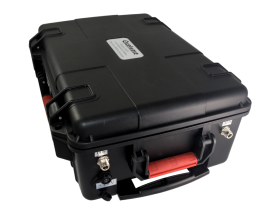 Assembled in a compact IP65 rated ruggedized case with roller, Ranger400, Ranger700 and Ranger800 can be easily moved to the site where urgent communication needs to be established, or installed on a vehicle for mobile uses. Ranger700 and Ranger800 can start to work within one minute once they arrive on site. Ranger400, Ranger700 and Ranger800 come with on-board power management for continuous power from their integrated lithium-ion rechargeable battery pack for up to 20 hours, switchable to external 100-240VAC or 12VDC sources as backup. They are designed for rapid formation of voice trunking communications, especially in unknown zones. The lithium ion battery is designed and manufactured at military grade that will perform well against vibration and shock. The internal battery management system protects the battery against over charging, over discharging, short circuit, penetration and thermal shock. The battery can be fully recharged in 3 to 5 hours by 120VAC source. With quick logic microprocessor, the built-in charger is featured with delta volt intuitive charging, fully automatic and multistage charging, zero spark technology, reverse polarity protection, temperature control and ignition protection. The LED lights indicate the state of charge to help you create peace of mind. The BDAs for Ranger400, Ranger700 and Ranger800 are signal booster with programmable uplink and downlink center frequencies and pass bands, so that only signals in the interested frequency blocks can be amplified to minimize the interference. The frequency blocks can be pre-set and stored, and can also be revised on site without additional equipment. 27dBm maximum output power and 75dB gain allow small to medium size dead zones have reliable radio communications for first responders. 30dB gain adjustment range allows users to configure the BDA to best fit different scenario. The built-in ALC offers stable output power even when the handheld is close to the service antenna, which protects the donor site from interruption. The BDA will auto turn off for self oscillation protection and can be configured for auto turn on once self oscillation alarm is dismissed, which maximizes reliability for the emergency communications. Accessible through the open case, the built-in LCD control panel allows the BDA operation frequencies and gains be configured and optimized easily on site without additional tool. Signal strength indicator and uplink and downlink input and output power readings help find donor signal source and set up the system in the field without additional equipment. Ranger700 and Ranger800 need to work with a donor antenna, a service antenna, an uplink cable, a downlink cable and supports for antennas. Please contact sales@excelwavetechnologies.com to order Ranger700 and Ranger800 kits, or for assistance to build your own accessory kit.